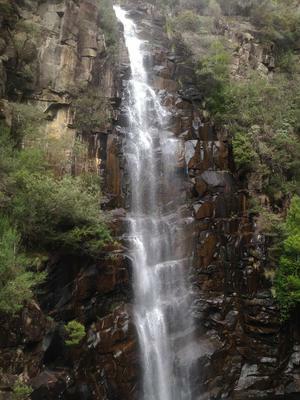 I have visited quite a few waterfalls in Tasmania (roughly 45-50) and I thought that it was about time that I compiled a top 10 list based on the falls that I have seen. 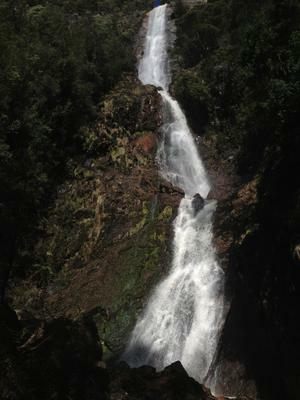 Waratah Falls is an impressive 40-odd metre high waterfall that I enjoyed for a couple of reasons. Firstly, I happened to see the falls during a time of high flow following a couple of days of persistent rains. Secondly, I also got to see the falls from its base by following a short trail that I had idea even existed before visiting. These things, combined with its height and its unique shape, made this waterfall a pretty memorable one and deserving of a place on the list. Bridalveil Falls was a waterfall that I found memorable not so much for its height (21 metres) as for its power and nice rectangular shape. I visited this waterfall after some good rain, so there was plenty of water in the creek, which was a key reason why I enjoyed this falls so much. 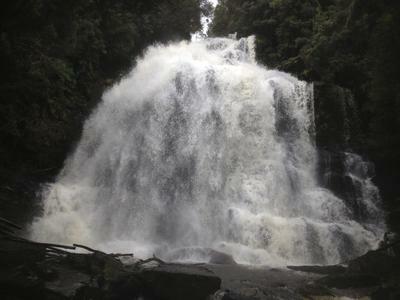 This falls, combined with the pretty Champagne Falls nearby, made for a pretty memorable waterfall outing. Liffey Falls is one of Tassie’s most famous waterfalls, and I have to say that while it did live up to some of its hype, I’m not sure how some people say that this is the best waterfall in the sate. Nonetheless, the falls was very pretty. I felt that the overall effect of the falls didn’t come so much from any one waterfall in particular, but was more a cumulative effect of the four, progressively more impressive falls. What further added to the scenic allure of the falls was the pretty high flow of our visit, which came directly after we had just been at Champagne and Bridalveil Falls. Russell Falls is undoubtably Tasmania’s most famous waterfall, and is thought by most to be the prettiest in the state, although I’ve never quite been able to see why. Perhaps this has something to do with the fact that I’ve unfortunately never been able to get to the upper tier of the falls. Don’t get me wrong though, Russell Falls is still a beautiful waterfall, and would undoubtably rank higher on this list had I been able to see the whole thing properly. Meetus Falls was a waterfall that felt like a great reward for effort when I got to see it. Even though I got to see the impressive 50 metre falls from the sanctioned lookout, I wasn’t satisfied with this and wanted to try and get to the base of the falls. So we (me and Mum) took the trail down to the river, which came out at a small waterfall a few hundred metres downstream from the falls. From here I had to rock hop upstream to get closer to the base of the falls (This would be practically impossible during times of high flow). Eventually though I came to a steep walled, narrow chasm, where the river had formed a deep pool. I could partially see the falls from here, but the view were very unsatisfying. Swimming through it was not an option, as the river flowed through forestry coupes and was most likely polluted. Instead, I had to embark on a pretty precarious scrabble up the side of the chasm to reach a makeshift lookout directly opposite the falls and roughly 15 metres up. The falls were a very good reward, flowing surprisingly strongly for a time of generally low flow (April). Overall, the falls definitely deserved a spot on the top 10 list. Nelson Falls was a waterfall that would most likely not be quite as high on this list had we seen it in more regular circumstances. Our visit came after pouring rain the day before, and snow the was melting into the rivers during our visit. Because of this, the falls was quite a site to behold, displaying unbelievable power as it tumbled over its 30 metre drop. The roar of the falls was quite deafening and the mist was such that it probably lowered to air temperature a good 7 or 8 degrees (celsius) even from the lookout some 50 metres away. Pelverata Falls is one of my favourite waterfalls to visit, simply because it lies not half an hour’s drive from our house. Even though it loses some of its vigour during the summer months and has even been known to dry up completely, during moderate/high flows it is quite a site to behold, and definitely deserves a spot in the top half of my top 10 list. The 100 metre waterfall that plunges into Waterfall Bay (which for some reason doesn’t have its own name) is one of the most unique and beautiful waterfalls in Australia, let alone Tassie. What further bumps this waterfall up the list is that I was able to get right up to its base as part of a cruise to Tasman Island recently. Before then the only way I had been able to see the falls was from a lookout which gave a good but somewhat distant view of the falls. Further adding to the allure of the falls during my latest visit was that it came after a good bit of rain, although I have seen pictures online of the falls trickling or dry during summer. St Columba Falls is a waterfall that I have been fortunate enough to visit on several occasions, and each time the falls has taken my breath away with its sheer height and power. This was despite the fact that my most recent visit was during a time of somewhat low flow. I have always found standing in front of the 90 metre high wall of water tumbling of impressive granite cliffs a quite awe-inspiring sight, and this falls definitely deserves a spot high on my list. 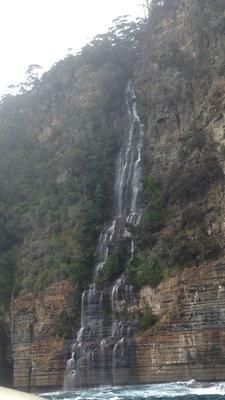 I can’t really think of any other word to describe this 104 metre high three-tiered waterfall other than spectacular. What further added to the falls’ allure was that my visit to the falls came after good rains, so the falls was fair roaring down the cliff. Several nice seasonal waterfalls along the trail and a scary but pretty cool budge opposite the falls didn’t hurt either, and Montezuma Falls just narrowly had to edge out Waterfall Bay and St Columba Falls to take the top spot on my list. SNUG FALLS: Even though this was a little off the pace in terms of getting onto my top 10 list, while I was little, this was by far my favourite waterfall, and I came here all the time and I must have visited upwards of 20 times in my 13 year life.